Whether you have or have not previously used industrial rubber products, you should gain a general understanding of the rubber compression molding process. Having this knowledge will accomplish three things: First, knowing what the process entails will help you choose the best rubber injection molding company. Second, it will give you a better appreciation of the finished product that you use. Third, it will help you quickly identify any defects. Material Selection – An expert at the rubber injection molding company you select will determine the appropriate uncured material for your project. Once chosen, the compression process begins. Shape and Weight – To control the shape and the weight of the finished product, the expert creates a preform using an uncured rubber. Compression – Next, the operator places the preform directly into the machine’s mold cavity. After the mold lid closes, two plates compress the material, forcing even flow to fill the cavity completely. 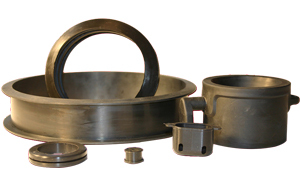 The material remains compressed between the plates under high pressure at an elevated temperature. Combined, that part of the process is what activates the curing of the rubber compound, vulcanizing it. Cycle Time – The expert determines cycle time as well, with the goal of reaching an optimal level of cure. At the end of the compression cycle, the two separate molded parts eject from the cavity. The advantage of having your product made by a trusted rubber injection molding company is that there are no defects. As a result, your product arrives on time and in perfect condition, based on your specifications. By following the necessary steps for the compression process, the expert avoids possible issues like blistering, porosity, and short moldings, meaning there was not enough rubber to fill the mold cavity or it did not distribute evenly. RPM Industries, Inc., has years of experience and unparalleled expertise specific to the rubber injection molding process. We also have highly trained experts who operate state-of-the-art machinery. When you combine all that, the outcome is a superior product that surpasses your expectations. Whether you need a standard finished product or something customized, we guarantee excellency 100 percent of the time. Visit our website or contact a company representative today.